We need to find out why you are in business (“Goals and Strategy”). What do you want? What makes you tick? There is no point in running a business if you don’t have any goals. If you don’t know what you want from your life, it is very difficult to work out how your business will help you get there. 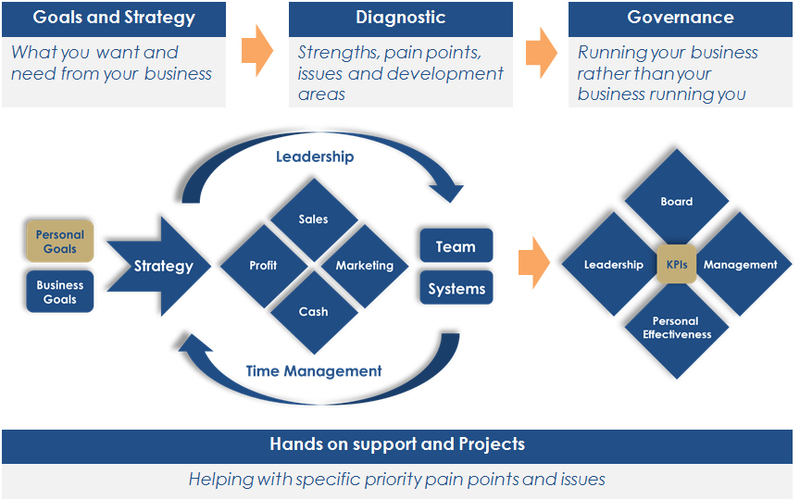 We need to understand the business (“Diagnostic”). We sit down with you and get to know the business, find out about your challenges; the pain points; the things that keep you awake at night. Areas that you need to develop or where you recognise that you need a bit of help. We need to determine what it takes to run the business and make it happen (“Governance”). It is really important that you set time aside each month to look at how the business is doing and how you can make it run better. Once you have all that, it’s a question of then making it happen – which is where our hands-on approach really makes a difference. In the diagram above, the middle of the diagram represents the moving parts that need to be in place to make what you want to get from your business actually happen. You need a powerful strategy to help deliver your business goals. And that has to be enabled by the core of all businesses: marketing and sales, cash and profit. We will work on all of these areas to improve them based upon the results coming from each of them. Are you generating the right number of qualified leads? Are you converting those leads into valued customers? Do you understand how much profit you make and where you make it? Are you converting profit into cash and are you using and managing it effectively? As your business grows, it is very important that you develop an outstanding team and that team eventually becomes your business. You also need to have the business systemised effectively so that the systems and process can grow with your business and aren’t dependent on you. Two further things hold a business together; your ability to be an inspirational leader of others and your ability to lead yourself. The second of those is, of course, just another way of saying ‘time management’, because time management is about personal leadership and effectiveness. Drawing all of that together is the governance structure than enables you to manage and control your business. If you don’t have a board meeting we’ll encourage you to put a monthly meeting in place, so that you can spend time each month thinking about how the business runs; stepping away from the nitty gritty and focusing on what’s really important. Alongside you in all of this sits Pro-actions as your trusted advisor, best friend, and harshest critic. We help you to put all of this into place and make sure your focus is on the important things that that your data is highlighting. And we aren’t afraid to roll up our sleeves and get involved with hands on support for specific pain points and projects as we progress. Put simply: we pride ourselves on giving you the help you need to work out what you want from your business and then make it happen. Pro-actions is a network of business coaches with expertise in helping business owners achieve their objectives through results focused coaching and support. We are a team of proactive, committed, positive and successful people who constantly strive to live with balance, integrity and honesty. Financial statements help you make better decisions! Time to review your Marketing Plan?